Turning Back The Clock serialisation – Chapter Six -Are you in danger of becoming an old fogey!! What do emotional factors have to do with anti-aging? It is sometimes difficult to see the changing image of ourselves in the mirror as we grow older. This applies not just to women but to men as well. 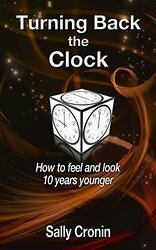 There are physical signs that our bodies are getting more mature; thickening waistlines, sagging skin, cellulite wrinkles and of course grey hair. If you have always taken pride in your appearance and looked after yourself, these visible signs of the passing years can be difficult to deal with. This is why plastic surgery, cosmetics companies, hair salons and anti-aging clinics do such great business. Billions and billions a year are now being spent on recapturing our youth and as we have seen in photographs in the press, the results are not always successful.